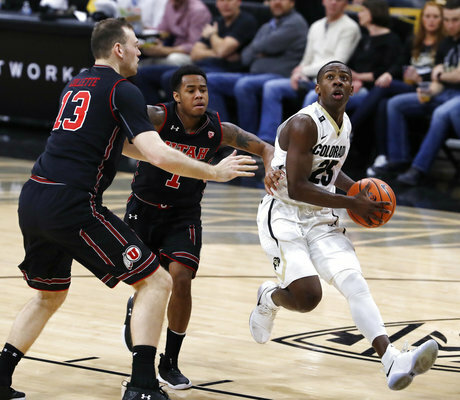 BOULDER, Colo. (AP) — McKinley Wright scored 21 points, Lucas Siewert had 13 and Colorado held Utah to a season-low point total in beating the Utes 67-55 on Friday night. George King added 12 points and 10 rebounds for Colorado (13-10, 5-6 Pac-12), which snapped a three-game skid as well as a seven-game losing streak to Utah (13-9, 5-6). It was Wright’s fifth 20-plus point game this season and first since he also had 21 points against Iowa on Dec. 22. Utah did not have a player score in double figures and was outshot by the Buffaloes 43.1 to 35.1 percent. David Collette’s eight points led the Utes, whose previous low point total came in an 85-58 loss to UNLV on Nov. 22. King said the Buffaloes focused their defensive effort on Utah’s perimeter shooters. 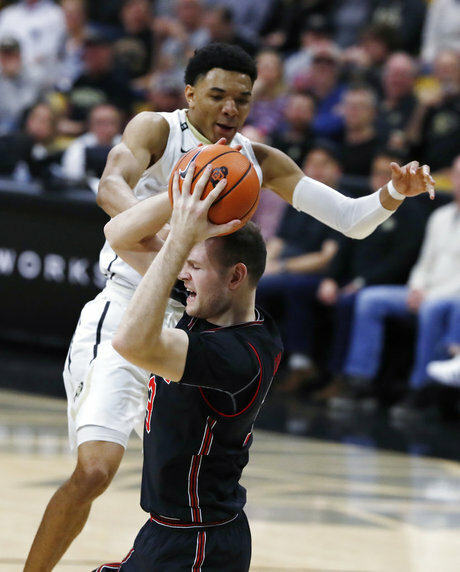 The Utes had come converting an average of nearly 10 3-pointers per game but finished with seven against Colorado, including two in the final 4:01 when the game was all but out of reach. It was just the opposite for the Utes, who never hit their stride offensively. Colorado coach Tad Boyle said the win, coming in the first part of a three-game homestand that concludes with California and Stanford next week, helps position the Buffaloes for a strong finish in the season’s final month. “I’ve said it earlier, you can’t win three in a row unless you win the first one,” Boyle said. “We’ve just got to take it as it goes but this is the time of year I think it’s really important that we are emotionally, physically, mentally ready to take on all the challenges that come in February and March. Utah got consecutive baskets from Justin Bibbins and Jayce Johnson to pull to 34-27 but Siewert then hit a pair of 3s on successive possessions and D’Shawn Schwartz offset a 3-pointer by Utah’s Donnie Tillman with one of his own, putting the Buffaloes up by 13. The Buffaloes stretched their lead to 52-35 on a 3-pointer and a pair of free throws by King. Colorado maintained its double-digit advantage the rest of the way. Colorado closed the first half with a 10-0 burst over the last 4:46 of the period to take a 27-20 lead. Wright touched off the flurry with a 3-pointer and capped it with a turnaround jumper that just beat the first-half buzzer. Utah: The Utes struggled offensively, especially from 3-point range, going 7 for 23 in losing to Colorado for the first time in four years. Bibbins, their leading scorer, epitomized their struggles, going 3 for 11 from the field, including 0 for 5 from beyond the arc. Colorado: The Buffaloes’ up-and-down season appears on the upswing again with a solid performance against a league rival. Colorado’s youthful squad has been inconsistent but shown it is good enough to beat some well-regarded teams when playing at its best. Bibbins finished with seven points on the night, ending a string of 11 consecutive games in which he had scored in double figures. King, who’s averaging a team-high 8.2 rebounds per game, had 10 rebounds to go with his 12 points for his 13th career double-double. Six of them have come this season. Utah: Returns home to host Stanford on Thursday night. Colorado: Continues a three-game home stand by hosting California on Wednesday night.